It’s perfect season for soups once again! Although Filipinos eat hot soups all-year round, from where I am at (Northern California), the colder weather calls for some really comfort soups to warm the tummy everyday. So I am getting ready my slow cooker and stock pots to make our family’s favorite soup recipes all throughout the season. 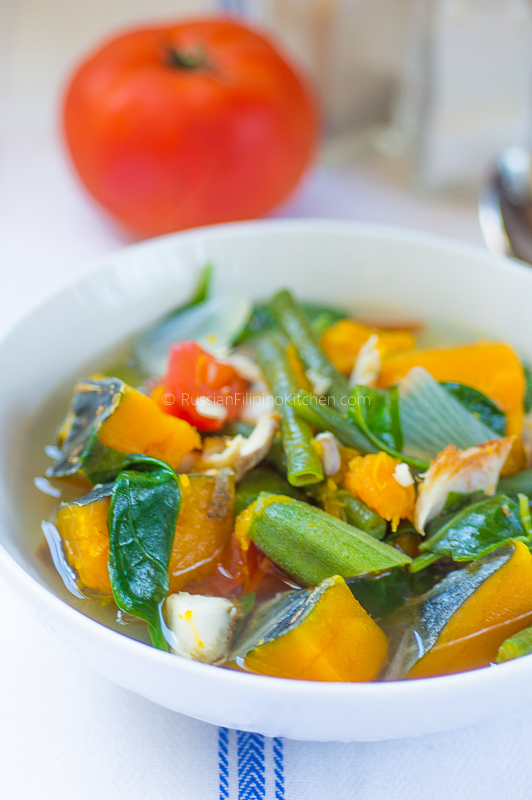 For today, I’d like to share with you guys a fish and vegetable soup known as “law-uy”. It’s very popular in the Visayas and Mindanao region in the Philippines, particularly in Cebu where I grew up. 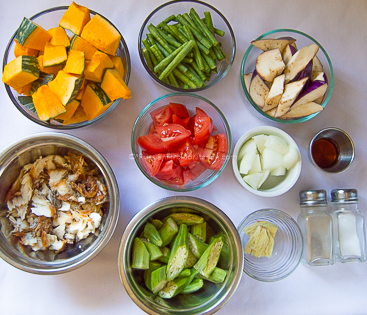 Also goes by the name “utan Bisaya“, it is a local favorite for its ease of preparation and delicious taste. You can get most of the ingredients for cheap or almost free if you grow vegetables in your backyard. Law-uy tastes best with the addition of fried shredded fish, but you certainly can omit it. I remembered when I was little and we didn’t have any fried fish to add to the soup, my mom usually just poured in some sauce from previous day’s inun-unan or fish paksiw to add flavor to the dish. 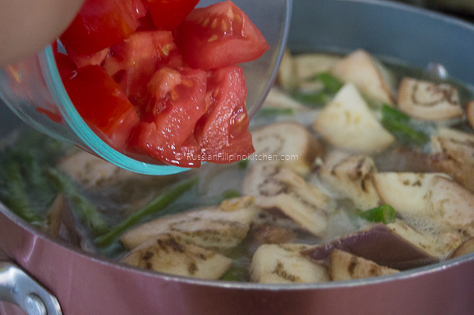 I boldly claim this soup is one of the easiest and healthiest Filipino recipes you will ever find in my blog! Fat-free and nutrient-dense, you can eat couple of bowls all throughout the day without worrying about putting an extra pound. In fact, many people can attest that this is one of the best foods to have when you want to lose some weight. 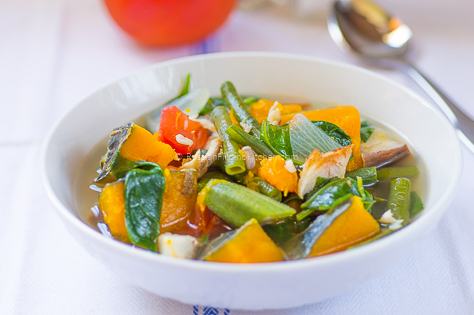 Packed with fibers and loaded with vitamins and minerals, consuming this soup on a regular basis is good for your health. Back in Philippines, we usually make this after pigging out with cholesterol-laden, high-carbs foods after a fiesta (or any special occasions) when we tend to eat in excess. 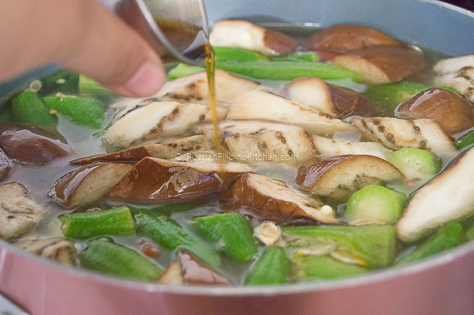 It’s sort of a detox soup that we always crave when we want something simple and still taste good without the grease and doesn’t have meat in it. Law-uy fits the bill. 1. Fill pot with water and throw in crushed ginger, onions, and shredded fish. Bring to a boil over medium high heat. 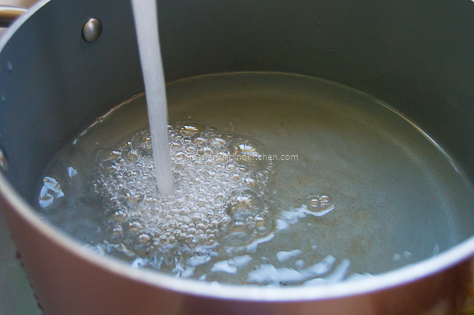 Note: speed up the boiling process by putting the lid on. This should take about 10 minutes. 2. 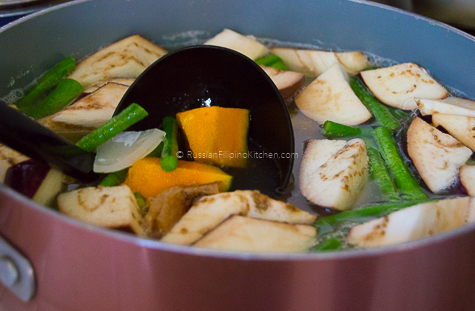 Lower heat and simmer for about 5 minutes. 3. Throw in the squash, green beans, and eggplant. Bring to a boil and simmer for another 5 minutes. 4. Add the tomatoes and okra and cook for about 2-3 minutes, just until limp. 5. Season with fish sauce, salt, and pepper. 6. 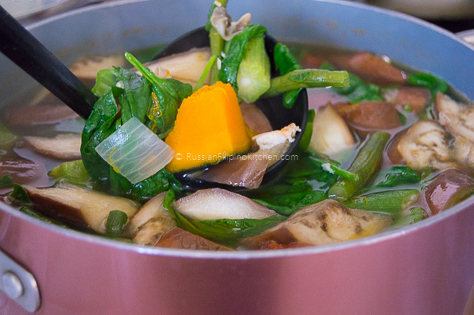 Turn off heat and add the spinach or malunggay. Stir to mix. The residual heat will cook the leafy greens enough. 7. Let soup stand for a few minutes before serving. 8. Ladle into individual soup bowls and enjoy! 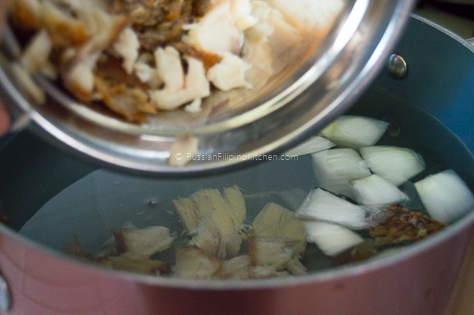 Fill pot with water and throw in crushed ginger, onions, and shredded fish. Bring to a boil over medium high heat. Note: speed up the boiling process by putting the lid on. This should take about 10 minutes. Throw in the squash, green beans, and eggplant. 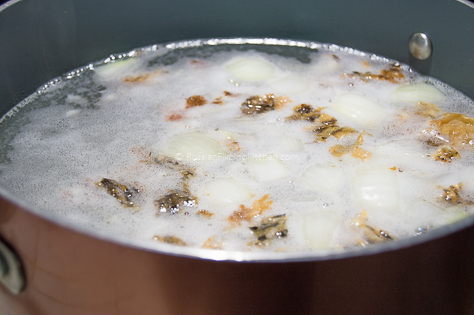 Bring to a boil and simmer for another 5 minutes. Add the tomatoes and okra and cook for about 2-3 minutes, just until limp. 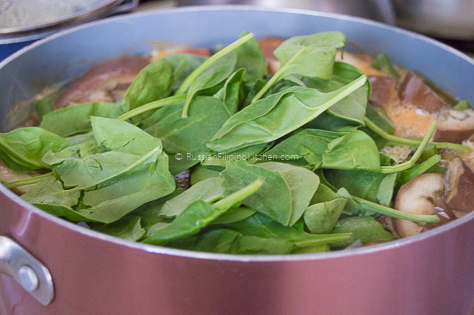 Turn off heat and add the spinach or malunggay. Stir to mix. The residual heat will cook the leafy greens enough. Let soup stand for a few minutes before serving. Ladle into individual soup bowls and enjoy!